Probably most people don't know, but banana peel can be used as a very helpful fertilizer in the garden, especially for roses. They contain a lot of vital nutrients. That's why banana peel are a real insider tip not just among enthusiastic hobbyists but also professional landscapers. Most gardeners don't want to use mineral or artificial fertilizer and are looking for natural alternatives. Despite the fact bananas aren't domestic fruits, they can be composted very easily. Even more, they can be used as organic fertilizer. Just cut the peel into small pieces by using a knife or scissors and mix it with the soil. Afterwards rake them directly next to the flowers. Especially for roses or other blooming flowers this fertilizer boosts the growth of leaves and blossoms. 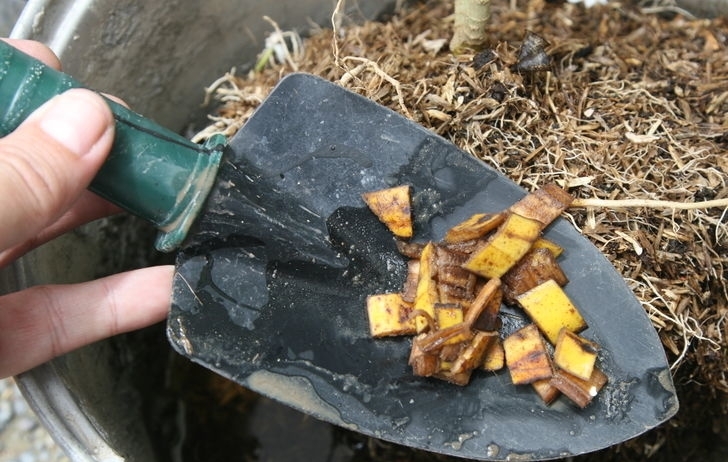 One can use banana peel as a natural substitute for potassic or magnesium based fertilizer. They rot very quickly mainly releasing potassium, magnesium, sulphur, phosphate, sodium and silica. They also contain other vital minerals and elements like calcium carbonate. But they're not a universal remedy. It is also important to know that some nutrients, which certain plants require, are not adhered. So there is a particularly lack of nitrogen and phosphor. This is the reason why banana peel can't replace a fully-fledged fertilizer. Some experts are concerned about a heavy contamination with chemicals. Most of them are pesticides to protect the fruit from insects, fungi or other diseases. Also other additive are used to extend the live span and keep them fresh, especially for the long journey from overseas. Most of these chemicals got stuck to the peel. If you are using them as fertilizer, these substances will also dissolve or migrate to and therefore enrich the soil. That's why it is highly recommended using organic bananas which are less, or at best, not at all chemically affected. Another very useful tip is to mix the peel with a bit of old coffee grounds. So get your roses ready to blossom anew!